The holidays are this close to kicking off for the season. 😳Are you ready? Am I ready? hahaha No. Not even close. I am a ‘last-minute’ person for everything. It’s how I roll. But this year I decided to get with the program and offer a huge Bead Box Bundle Sale. What’s that you ask? In short, it is a bead sale for artists, crafters, and the people who love them. Lots of bargains and ample time to create all of your special gifts in plenty of time for the holiday season. I have dug deep in my bead boxes and created many (oh so many!) eclectic bead mixes of first quality beads that are singles and one-of-a-kinds that don’t exactly match in a set. Also lots of focal beads — dogs, cats, fish, birds — that are ready to be adopted into loving homes for the holidays. The Bead Bundle Page is now live! If you do not see a listing, it has sold. Hurry – once they are gone, they are gone! Looking for something else besides loose beads? Everything in my shop will be on sale, at varying discounts, noted on each item. All discounts will be automatic on my site except for the watercolor printed items and original art prints section of my shop. You will need coupon code Print2018 for these items. The discount is 10% on all printed items for this sale period. UPDATE: I had struggles setting up my cart. ALL items in my shop are 15% off for this sale using code BeadBoxBundle15. Works for all items! Sale dates November 19-27, 2018. 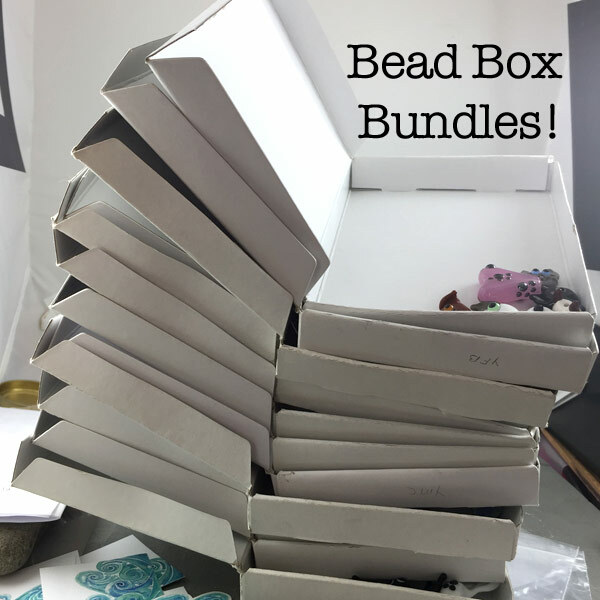 Working on Bead Box Bundles now… will update this post when listings are live. Shipping charges apply for 3rd party printed items (notebooks, mugs, etc.). Additional details on the shop section page and each item page. Free US Postal shipping for all stickers, original art prints, and glass art on my site. Isn’t it fun when you shop and get a little gift for yourself with purchase? I love that. So I am offering a free square ‘watercolor wave’ vinyl sticker with each order! Keep it for yourself or gift it along with your bead art. Note: Limited quantities on this offer, first come, first served. These are the first edition of my wave stickers. They are UV-resistant vinyl. It is a thin vinyl, but quite durable when applied. You can use them as-is or cut the white to accent the waves. I also have my ‘second edition’ watercolor wave stickers that are available now in my shop. I ended up going with these because they are a heavier vinyl and they are pre-cut. Quantity discounts available – please see the listing for full details. Second edition: Same art as the first edition, but thicker vinyl and pre-cut! Previous post: Catch A Wave!